“Teddy Pendergrass: Gone But Never Forgotten” – Sunday, 5-7pm On 94.1 WHRP! 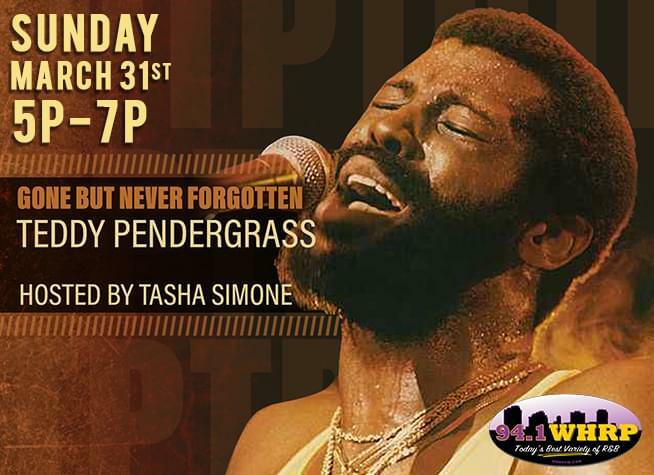 Join 94.1 WHRP for a special look at the legendary Teddy Pendergrass in “Gone But Never Forgotten”, this Sunday from 5-7pm. Teddy Pendergass, also known as “TP or “Teddy Bear”, got his start as a drummer when he was discovered by Harold Melvin, leader of The Blue Notes. After recruiting Teddy as drummer, the group realized that Teddy had a great voice too, and he was then made lead singer for the group. Hear more about the life, talent, solo career and the life-changing accident that shaped the later years if Teddy Pendergrass’s journey in music this Sunday from 5-7pm with host Tasha Simone on 94.1 WHRP.